The second half has been daunting for University of Miami basketball all season long, and the situation was no different on Wednesday night. Despite leading 34-31 at halftime, the Hurricanes came out flat in the second period and allowed the No. 15 Florida State Seminoles to pick apart their defense. Florida State exploded to start the second half on a 16-2 run, for which Miami had no answer, and went on to win 75-57 at the Watsco Center. UM (14-7, 4-5 ACC) had cut the lead to as few as seven with just under 10 minutes left to play, and it looked for a moment that the Canes had its rhythm back. Senior captain Davon Reed dived to the ground to save the ball from going out of bounds. Miami ball. The crowd had its energy again. But, freshman forward Jonathan Isaac answered with five straight points, including a corner three-pointer that led to a Miami timeout. 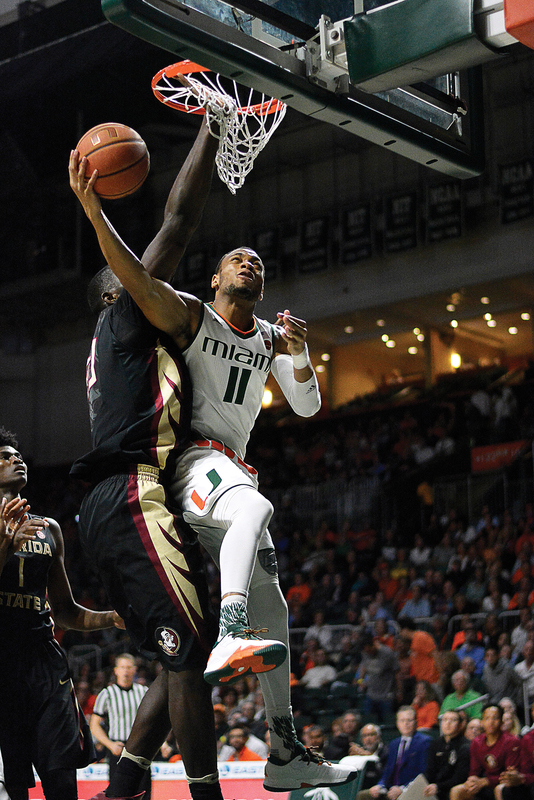 UM fans were silenced once again, and the many FSU (19-4, 7-3 ACC) fans in attendance roared. Miami would not recover, getting outscored 24-13 the rest of the way. Florida State exhibited precise passing and ball movement, stretching the lead to as many as 22. Brown, who had been on a hot streak the last three games, struggled from the start, missing his first-four shot attempts. The Hurricanes tallied just five assists, while turning the ball over 14 times. Coming off a win in which the Miami offense dominated No. 9 North Carolina, the Hurricanes stumbled against the Seminoles’ swarming press-defense in the second half, leading to stagnant offense and difficult shot-attempts. Florida State shot 52 percent from the field and made seven three-pointers. Four FSU-players scored in double-figures, led by Isaac and sophomore leading-scorer Dwayne Bacon who combined for 30 points. The Noles snapped a two-game losing streak. Brown finished with 17 points and five rebounds. Reed and junior guard Ja’Quan Newton added 12 apiece. Fouls were a common occurrence. The Canes shot 22 free throws, while the Noles shot 15. In Larrañaga’s 1,000th game coaching, Miami dropped just its third home-loss since the start of last season. The Hurricanes will face off against the NC State Wolfpack for the second time this season. Tip-off is set for 3 p.m. on Saturday in Raleigh, North Carolina.